Black American versus African-American: Why I prefer to be called a black American. How a trip to Kenya changed the way I think about the terms African-American and black American. LeVar Burton as Kunta Kinte in Roots. I am at least partially African, genetically speaking. A few years ago, my father took an ancestry DNA test, which revealed that some of his roots can be traced to Nigeria. But I don’t consider myself Nigerian-American, or even African-American. Where I’m from is America—who I am is a black American. I was about 7 or 8 when my dad sat me down to watch Roots—all 500 hours of it—recorded on VHS tapes from an ’80s cable rebroadcast. 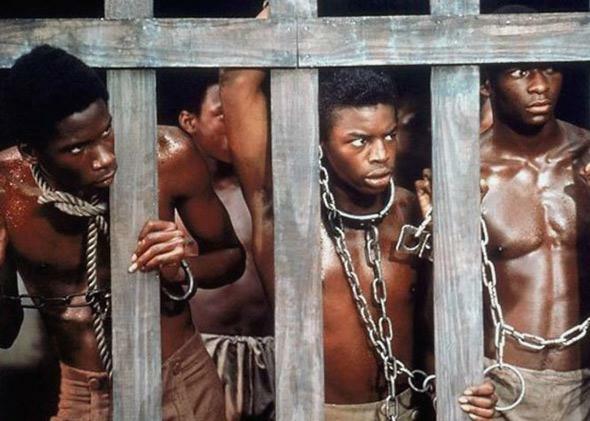 Alex Haley’s tale of genealogical discovery resonated with my father as a powerful attempt to re-establish the lineal connection between Africans and African-Americans that had been erased by slavery. Roots was just one of the African-themed cultural artifacts that my father introduced to my sister and me: There was also the gorgeous soundtrack to Sarafina!, a Broadway musical about the Soweto Uprising in South Africa; the African-themed art in our home; Anansi tales; Kwanzaa celebrations. He attempted to instill in us not just a sense of pride as black Americans, but as Americans of African descent, and throughout my adolescence, I identified as black and African-American interchangeably. All of this without knowing, at the time, from what country our ancestors had come, due to the loss and erasure of their birth records prior to the turn of the 20th century. Despite my father’s efforts, however, my first in-depth encounters with first- and second-generation Americans who had immediate family from African countries made me question my adherence to the label of African-American. To me, people with such explicit connections to their relatives’ home countries accurately embody the term; they truly have access to both cultures. As someone who grew up with a much stronger sense of my black American roots, and an understanding of African culture distilled primarily through an American sensibility, I feel as though the term African-American doesn’t quite suit my identity. That didn’t stop my father from (sort of) jokingly asking, upon my return from Kenya last month, “Did you feel different when you landed in the motherland?” What he meant, of course, was whether I felt as if I’d returned “home” to a place I’d never before been. People have spent their whole lives hoping to find the equivalent of their own personal Zion. Had I? My answer to him, without hesitation, was no—at least not in the way he meant it. I definitely felt different in Kenya, but it was the kind of difference I imagine everyone experiences when exploring an entirely new place for the first time—that of a tourist. (I suspect that visiting my supposed ancestral homeland of Nigeria would produce the same effect.) In addition to the obvious differences in transportation and living conditions (livestock roam the streets even in urban areas of Kenya), there were smaller but significant cultural gaps. While the wedding featured familiar traditions like the tossing of the bouquet (accompanied, naturally, by a sound bite from that universal anthem “Single Ladies”), many parts of the ceremony were in Swahili, the country’s official working language alongside English. Even some of the jokes the emcee made in English delighted the Kenyan guests but flew over my head—I later had one of the guests, a cousin of the bride who also lives in the U.S., explain the playful digs to me. But it’s not just the lost-in-translation humor that made me frequently aware of my outsider status. Having to explain what I am—an American with American parents, grandparents, and great-grandparents—emphasized the gulf between the Kenyan understanding of race and my own. For the Kenyans I interacted with, having black skin also means being African. For me, being black means, well, being black. This blunted the charges of the Civil Rights and Black Power movements and eased the conscience of a nation that had just barely begun to reckon with the harshest contours of its history forged in white supremacism. Americans who traced their ancestries to the Great Wave of immigrants who arrived at Ellis Island at the turn of the 20th century couldn’t be blamed for the horrors of slavery or Reconstruction, or so the thinking went. In hindsight, I had nothing to be ashamed about; the family crest I created was just as valid as any of the other kids’, even if I couldn’t claim to know for certain the foreign lands in my family history. But it wasn’t the last time I felt a tinge of inferiority. Later, when I was in college and met African immigrants or first-generation African-Americans, I felt it again. I’ve since changed my point of view on that as well, however, and am comfortable now with defining myself by my upbringing rather than by where my ancestors may have come from. The distinction between black and African-American has been expounded upon in recent years, on both a semantic level (Slate just this year changed its standard from African-American to black American) and, by extension, a cultural one. I know I’m not alone in wishing to identify as a black American. And I believe that every individual, and especially people of color, who so often have their existences defined by the standards of a white majority (recall, for example, the one-drop rule), should be able to identify as they see fit. I don’t see my preference for being called a black American as a way of denying or distancing myself from my genetic African heritage. Rather, I believe it acknowledges the similarities that do extend to all black people—in spite of our differences—as black people: the prejudices we can face from nonblacks (from police brutality to skewed standards of beauty) to the cultural influences we share with one another, like the aesthetic notion of “black cool,” traced to West Africa and translated more recently into black American art.